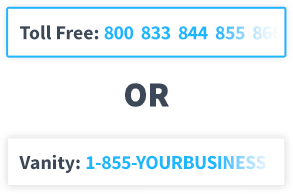 Select a vanity toll free number in any toll free prefix (800, 888, 877, 866, 855, 844, and 833) and choose the perfect vanity 800 number for your business. Forward your custom vanity telephone number straight to your cell or use our cloud phone system to greet and route calls to any phones, extensions, or voicemail. With a vanity number from UniTel Voice, you can receive calls, faxes, and voicemail anywhere, anytime, on any phone (home, office, or cell phones). Vanity 800 numbers are widely used by businesses both large and small, and because of that usage, there’s an undisputed sense of trust and credibility associated with them. For new startups, in particular, using a vanity toll free number as your business telephone number can make your company look more established and even give you a national presence. With UniTel Voice you own your vanity toll free number and can port it to another phone service provider at any time. If you move, open another location, or change phone systems, you can keep your toll free vanity number and take it with you as your business grows. Make it easy for your customers to reach you by getting your own vanity number from UniTel Voice. Just like your website address, your business’s toll free number can be a brand asset too. When you use a vanity toll free number Strengthen that spells a word related to your company’s name or value proposition (think, 1-800-FLOWERS, 1-800-DENTIST, or 1-800-HAUL-JUNK). When you customize your 800 number you are not only boosting your brand’s recognition, you’re making your toll free number easy-to-remember, especially in offline advertisements (i.e., TV, radio, billboards, and vehicle decals), but also in newer mediums like voice search. Just like your website address, your business’s toll free number can be a brand asset too. When you use a vanity toll free number Strengthen that spells a word related to your company’s name or value proposition (think, 1-800-FLOWERS, 1-800-DENTIST, or 1-800-HAUL-JUNK). When you customize your 800 number you are not only boosting your brand’s recognition, you’re making your toll free number easy-to-remember, especially in offline advertisements (i.e., TV, radio, billboards, and vehicle decals), but also in newer media like voice search. 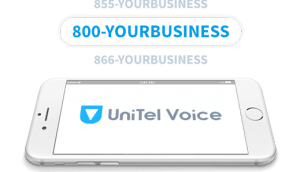 When you buy a vanity 1-800 number from UniTel Voice you’re not just purchasing affordable toll free phone service, you’re getting the complete UniTel Voice virtual phone system designed startups and entrepreneur’s run their business from anywhere. With a vanity phone number from UniTel Voice, you can run your business using cell phones and still look, sound, and function like a Fortune 500 company. Why Get a Vanity Toll Free Number from UniTel Voice? UniTel Voice is one of the smartest and cheapest vanity phone number services available. We offer affordable vanity toll free numbers for every budget. 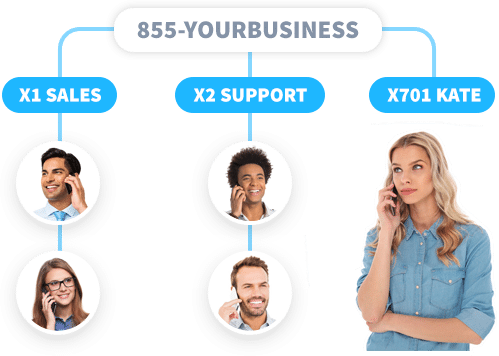 All vanity 800 number plans include the same amazing features and 100% USA-based support to ensure your phone service is up and running fast and easy. 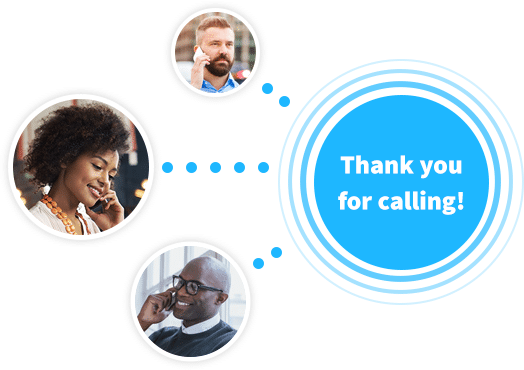 UniTel Voice uses an industry-leading network with world-class reliability to keep you connected, so cheap vanity number service doesn't mean low call quality. While some vanity number service providers rent or lease their custom toll free numbers, with UniTel Voice you own your vanity 800 number - no strings attached. 1. Can UniTel Voice help me find a vanity phone number? Yes, UniTel Voice has access to all available toll free vanity numbers via direct access to the FCC’s National Toll Free Number Database. We allow our customer to search this spear pool numbers in real-time. If you can’t find the vanity phone number you want our support team is happy to help with your search at no charge. 2. How do I search for variable vanity toll free numbers online? Our sign up page allows you to search for and select the vanity toll free number of your choice before you complete your order. You can search for vanity numbers in the following area codes 800, 888, 877, 866, 855, 844 and the newest toll free area code 833. You can run search queries based on a numeric combination (e.g., 855-1234567) or based on a keyword or phrase (e.g., 833-HOME-LOAN). Our vanity search tool will tell you if the number is available and if it’s not, it will recommend some alternative vanity number options there are available for instant purchase. 3. Are vanity 800 numbers still available to buy? Yes, but there’s only a limited amount of 800 numbers for sale left. That’s because the majority of true 1-800 vanity numbers are already in use with other companies. 4. What is a considered to be a good vanity number? You want your business’s phone number to be easy to say, spell and remember. With that in mind, you’ll want to get a vanity phone number that spells your company’s name in some form or another (like 1-800-GOFEDEX). If you can’t find a vanity toll free number that spells your business’s name, another good option is to get a vanity telephone number that’s related to your industry or value proposition (for example 855-ROOFING or 844-CLEANEZ). 5. Can a toll free vanity number be longer than 10 digits? Yes, more often than not, a company’s name is not exactly 7 digits long. In that case it’s perfectly acceptable to use a custom 800 number that includes “over dials” like the insurance company Progressive does: 1-800-PROGRESSIVE. 6. Can you buy a local vanity phone number? No, not really. The reason it’s hard to buy a local vanity number because local numbers are not housed in a centralized national database like toll free numbers are. With toll free phone numbers, companies like UniTel Voice can build custom number search tools to query the centralized database of available numbers, but unfortunately, the way the FCC distributes local numbers is in individual batches to each North American phone company. Essentially there’s just no good way to search for ALL available local numbers by word, phrase or numeric combination. But you might just get lucky with what local numbers available your current provider. UniTel Voice has local numbers available in almost every area code in North America. 7. 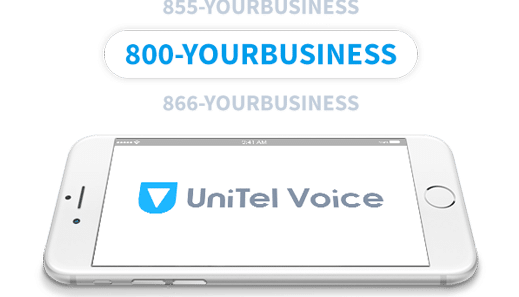 Does UniTel Voice rent or lease custom vanity phone numbers? No. UniTel Voice sells vanity toll free numbers directly to its customers. In other words, if you by a vanity 800 number from us, you own the number and down the road, if for any reason you want to cancel your phone service with us, you can port your number to another toll free service provider of your choice. 8. Can I buy a toll free vanity number outright from UniTel Voice and transfer it to my current provider? Yes, the way that works is you would sign up for an account with UniTel Voice and buy the vanity number you’d like. Then you would contact the company you wish to transfer your UniTel Voice telephone number to and that phone company would contact us with a port request on your behalf. If you buy a vanity number from UniTel Voice you own the number. 9. What can I do if the vanity 800 number I want is unavailable? 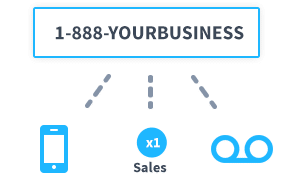 If the vanity 1-800 number you are looking for is unavailable you should consider getting a custom toll free number in a different toll free prefix like 888, 877, 866, 855, 844, or 833. There’s way more options with these newer prefixes and huge Fortune 500 companies use them – so they’re just a good as the traditional 1-800 numbers. The other thing to consider is it’s incredibly hard to track down the owner of a disconnected 1-800 number to see if you can purchase it from them. It’s just not worth your time or money and unfortunately, there’s no “GoDaddy of vanity 800 numbers” out there that will do the work for you. 10. Will UniTel Voice do a free vanity number search for me? Yes, you can search for vanity numbers right on our site or you can ask our customer service team to brainstorm some good vanity number ideas and do a quick search at no cost and no obligation to purchase. We’ll simply tell you what numbers are available and if you want us to help you secure them. 11. How do I pick a good 1800 vanity number for my startup business? Before you pick your business’s 1-800 vanity number, or domain name for that matter, you’ll need to come up with a great name for your business – which in and of itself is an overwhelming, frustrating, and exhausting experience (see Quora for naming help). But once you’ve gone through that arduous process and confirmed there are no copyright issues, you’re ready for the next challenge: getting a good vanity 800 number for your business. A task, we’re sorry to say, more challenging than finding a URL. Why is it so hard to find good 1-800 vanity numbers? One simple reason: supply. True 800 numbers have been around since the 1960s and there are only so many numbers available. But don’t lose hope! 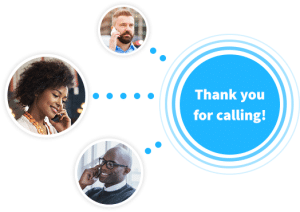 Here at UniTel Voice we’ve helped over 20,000 customers find the perfect toll free number for their business and in doing so we’ve learned a few tricks we’re delighted to share with you below. Tip 1: A good vanity number doesn’t have to include your business’s name. 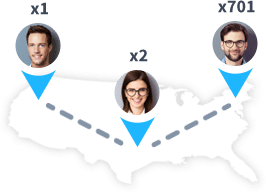 Having your phone number spell your business’s name might seem ideal (like 1-800-XFINITY), but unless your name is exactly seven letters and you get extremely lucky with availability, you might have to go another route, which isn’t necessarily a bad thing. Consider using words or phrases that relate to your value proposition, your industry, or simply the services you provide. Let’s say your roofing business. You might try to find custom toll free numbers with the phrase “FIX-ROOF, EZ-ROOFS, or (if you got really lucky) 1-800-ROOFING. Vanity numbers that use value propositions are easier to remember because they put your business’s services in context. Tip 2: A good vanity number doesn’t have to be a 1-800 number. If you can’t buy a 1-800 number try another toll free prefix such as: 888, 877, 866, 855, 844 or the newly released toll free 833 numbers. Since there are simply less 800 numbers available you have more vanity number choices with the newer prefixes. If you can’t find the perfect vanity number with the prefix 800 try 855, 844, or 833. Fortune 500 companies, game shows, and even government agencies do it all the time. The important thing is your number is relevant and memorable. Tip 3: Chat or call us. Coming up with vanity number ideas can be stressful. Our team here at UniTel Voice is happy to help you brainstorm some ideas and even do the dirty work of searching through the spear pool of toll free numbers to help you find the perfect vanity number. We’ll search your company name, your value proposition, and terms related to your industry and services. We’ll even try every action word we can think of (like “GET” “CALL”, “SAVE”, “BUY” or “SELL”). Just contact us and we’re happy to come up with a list of ideas, search every possible combination of available numbers, and email you a list of what’s available at no cost or no obligation. And you can always use the free search tool on our site. 12. What vanity 800 numbers are the most memorable? The crown jewel of vanity numbers is a one that incorporates your brand name. Examples include 1-800-Xfinity, 1-800-Holiday (Holiday Inn’s number), or 1-800-Progressive. Unfortunately, these brand name vanity numbers are sometimes hard to get because there’s a limited supply of 800 numbers for sale. You might have to settle for an alternative vanity toll free number prefix such as 888, 877, 866, 855, 844, or 833. 13. What if I can’t find a vanity toll free phone number related to my company’s name? Another great vanity number option is to use a toll free number that relates to your industry. For example, if you are a Roofing company, you might use 888-Roofing. Or if you sell beef jerky you might choose 844-44-Jerky. Again, if the custom 800 number you want isn’t available – you may have to go with an alternative toll free area code. 14. What if I can’t find any vanity phone numbers related to my business’s name or industry? Another great vanity phone number option is using a CTA (call-to-action) that relates to your business’s value proposition. For example, if you offer business loans you might use 855-FASTLOAN or 877-EASYLOAN etc. Using CTAs like “GET”, “SELL”, “FIX”, and “BUY” or descriptor words like “FAST”, “EASY”, “CHEAP” turn your phone number into a memorable advertisement.